“The beauty of a woman is not in the clothes she wears, the figure she carries or the way she combs her hair. In high school my senior superlative was “prettiest hair”, being of a mixed ethnic background my hair is naturally curly. It doesn’t require a perm or relaxer, a blow dryer and flat iron will do just fine. Some may say I have “good hair” I prefer to say a diverse mixed texture. I have always heard my hair is my thing (whatever that means). I assume it’s because I have a nice length of hair that allows me to do just about any style. I can account for each time I have done something drastic to my hair, my freshman year I went with the fad of long in the back short in the top. That died out for me after ninth grade. After boot camp I dyed my hair a number of colors utimately altering my natural color permanently. In October 2005 I cut my hair for the first time in nearly 6 years, and not just a trim, my beautician used electric clippers. The photo I took her was Phoebe (Alyssa Milano during the 4th season of Charmed). I believe that particular cut is called a Pixie Cut. My mother nearly fainted when I showed up to her house that night. I wore my hair short for about a year and a half allowing it to grow back only to start the trend of shaved sides in early 2007. (Not really sure why my true friends didn’t tell me how stupid that looked). Then I went white blonde for a couple years, not realizing the bleach was damaging my hair. At the end of the blonde bombshell era I needed a cut to remove all the dead hair. 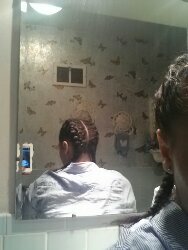 I finally allowed my hair to grow back completely allowing me to rock my infamous “bun” and “gangsta braids”. That was until I decided on a bob hairstyle about five months back. So here we are on August 3, 2013 and I have yet again made another drastic hair change. After all it’s just hair and it grows back, right? I am happy that you find joy in taking on different hairstyles. You have hair. Might as well wear it in different natural styles. I’m with it!! !